Author and speaker Mary DeMuth gives “10 ways to spot it,” including charismatic leaders who demand unquestioning obedience, avoid criticism, and create a culture of fear and shame. When I saw a checklist like that a few years back, just browsing the Christian books aisle at Barnes & Noble, it suddenly hit me: I had experienced spiritual abuse. When I was 16, a few well-liked pastors at my church were very suddenly and mysteriously laid off, including my youth pastor. Youth and parents alike tried to ask the senior pastor for information, ascertain from him what would be happening post-layoff, or at least express to him our sense of surprise, loss, and even distrust. He wouldn’t hear any of it. Instead, statements were made about “gathering a small core of leaders to move us forward into God’s promised future” (#8 on DeMuth’s list). After about 2 months, I was invited to be one of those leaders and told things like: “The other youth look up to you. We really need your support.” When church leadership didn’t get my support, they shook their heads as if mourning the fate of my soul and said: “You know the godly thing to do is to obey your elders” (#2 and #4). Has this had effects long-term? Absolutely. It’s caused wariness toward religious leaders, a sense of fear when a church announces even the most natural of organizational changes, and perhaps above all frustration when leaders refuse to listen. 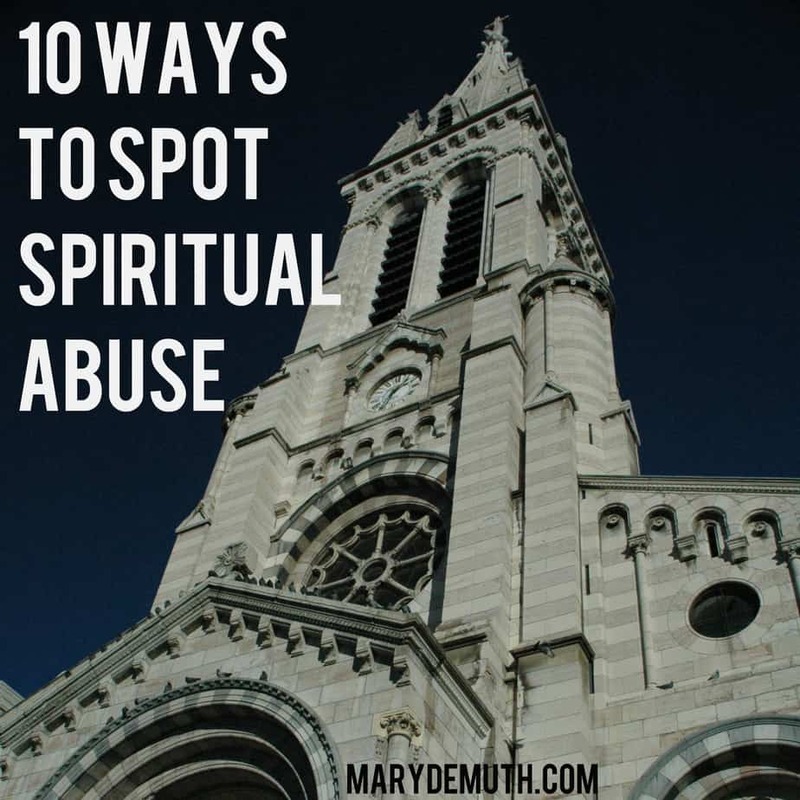 I would argue that not listening lies at the root of spiritual abuse (or probably any abuse for that matter). By that, I mean listening to God and to others. If you love someone you listen to them. And Jesus did say the greatest commandments are to love God and love others (Matt. 22:37-40). Being listened to helps us learn trust rather than fear and helps us learn to process healthily rather than worry unhealthily (an interesting distinction). Thankfully, in college and beyond, I started encountering religious leaders who listened well. Be it for 1 minute after a church service or for 1 hour over coffee, they’ve honored my humanity in all its crazy spectrum of sins and celebrations. So, I can’t wait to write more in an upcoming post or two about the very real healing that can take place even when spiritual abuse has occurred. Previous postWhy Do I Write About Mental Health and Spirituality?